Chief Minister Virbhadra Singh said though personally he was not in favour of Palchan-Rohtang ropeway, but he would certainly take up this matter with the National Green Tribunal (NGT) on priority so that this issue could be resolved in an effective manner.He was addressing a public meeting at Bahang (Manali) in Kullu district today. He said he has received objections from representatives of nearby Gram Panchayats and state government was determined to find out some amicable solution for this problem under the directions of NGT.He said that the orders of the NGT to reduce traffic congestion have affected those who earn their livelihood from small kiosks and dhabas en-route Rohtang, besides the taxi operators for whom their bread and butter was the taxi business carrying tourists to the Rohtang Pass. The climate change was perhaps due to global warming and not vehicular traffic. There has been vehicular movement through this pass since ages which was also gateway to Lahaul and Spiti and the road leads to Leh-Ladakh. There were many social and environmental related reasons and the leaders of BJP from the area were trying to politicise the issue for their benefit, said the Chief Minister. He agreed that environment being a big issue, the traffic should be minimized on this route but not stopped at all. He urged the BJP leaders to cooperate with the government for resolving this issue instead of politicizing it.He said that Kullu-Manali was known worldwide for its tourism potential and the government was committed to exploit the vast tourism potential.The Chief Minister said the forest clearance was awaited for setting up Medical college at Hamirpur. The fate of AIIMS was hanging midair due to infighting of the leaders of BJP that whether to open the same at Bilaspur or shift it to other place, despite the fact the state Government has given enough land as required. Referring to the unprecedented developments that taken place in the State, the Chief Minister said Himachal was one of the leading state in field of education as the literacy percentage has increased to 88 percent. He said that the per capita income which was Rs. 240 in 1948 has crossed Rs. 1,50,000 mark. 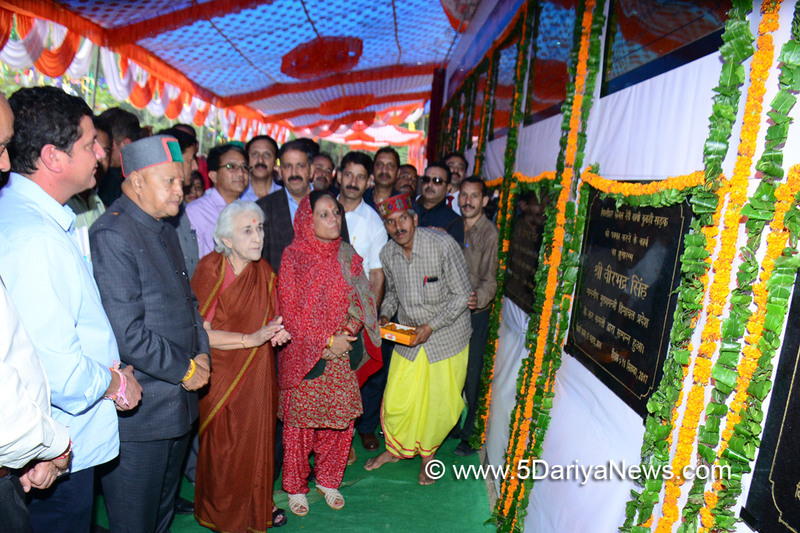 Virbhadra Singh announced Fire Station for Patli-Kuhl and upgradation of civil hospital Manali to 75 bedded hospital. He also announced to provide adequate funds for construction of Manali-Aleu bridge.Earlier, he laid foundations stones of several projects of Irrigation and Public Health, PWD and other departments.The estimated cost of 10 bridges, 10 roads and two buildings is around 63 crore which includes foundation stone of road from Solang Nallah to Solang village to be completed with an outlay of Rs.2.62 crore. He laid foundation stone of bridge over Shanag Nallah, cementing of road from Burwa to Majhach and road from Jagatsukh to Bhanara.He laid foundation stone of a bridge over Beas river at Nehru Kund to be constructed at a cost of Rs. 6.45 crore, a bridge over Sajla Nallah to be completed by with an outlay of rupees one crore, bridge over Jagatsukh Nallah to be constructed at a cost of Rs.4.07 crore, bridge over Haripur Nallah on which Rs.1.78 crore is to be incurred, bridge over Prini Nallah to be completed by spending Rs.1.56 crore and another bridge over Chhaki Nallah to be constructed with an outlay of Rs. 3.37 crore. He inaugurated bridge over Shanag Nallah (Majhach)completed with an outlay of Rs. 1.11 crore, Sub Market Yard at Chauri Bihal constructed at a cost of Rs.1.40 crore, and double storey building of Government Senior Secondary School (GSSS) Haripur. The Chief Minister inaugurated water supply scheme Hallan-I to cater to the population of 1500 on completion. He laid foundation stone of WSS Solang Nallah and WSS Jagatsukh to cost Rs. 94.24 lakh to cater to the need of population of 81500.Former Member of Parliament Smt. Pratibha Singh while addressing the audience said during her tenure as a Member of Parliament, the work on Rohtang Tunnel Project was initiated, adding that time and again requests were made to the central government for expansion of Kullu Airport and finally it was done. She said that the state government was indebted to the then UPA for providing a sum of Rs 40 crore for major water supply schemes which includes to Rs 16 crore for Manali town and of Rs 22 crore for Kullu town.Irrigation and Public Health Minister Smt. Vidya Stokes, BCC President, Mandi Shri Bhuvneshwar Gaud, DCC(women) President Smt. Vidya Negi, Chairman, Kullu-Manali Tourism Development Division Shri Anoop Thakur, Former Zila Parishad President Shri Hari Chand Sharma, Pradhan Gram Panchyat Shanag Shri Pratap Thakur were also present on the occasion among others.